Margaret Ibrahim with husband Amin Ibrahim. Pic Matt Mackey - Presseye.com. Damage caused to the Ballymena home. Pic Matt Mackey - Presseye. Margaret her husband Amin Ibrahim. Matt Mackey - Presseye. 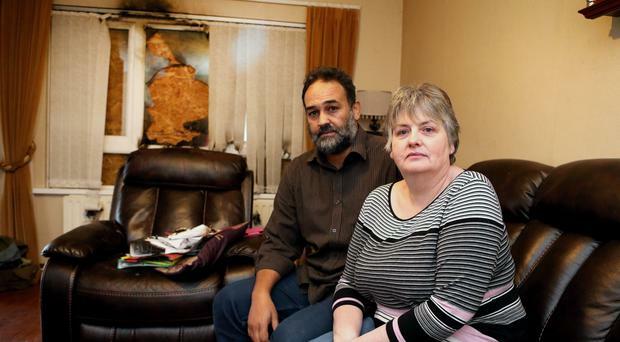 A Muslim Ballymena family believe they were targeted in a petrol bombing because of the terrorist attacks in Paris on Friday. Amin Ibrahim (48) his wife Margaret (54) and their children Sarah (19) and Muhammad (17) were in the house at Kintyre Park in the Ballykeel One estate in Ballymena, County Antrim, which was hit in an early morning petrol bomb attack. Police have described it as a "religious hate crime" and now the family is preparing to flee their home in fear. They believe the attack could have killed them. A petrol bomb was thrown at the living room window sending glass cascading across the room and fire damage was caused to a chair. The family were all upstairs and the only injury was caused to Mr Ibrahim's feet which were cut on the glass when he rushed to put out the flames. Mr Ibrahim said on Tuesday morning: "I ran down the stairs to put the flames out and was in my bare feet and cut my feet on the broken glass. "Over the years there have been many attacks on our home. There have been smashed windows, damaged cars, throwing eggs, calling you names and have written things like 'Bin Laden' and 'go home to where you came from' but it has never stopped me living here. "My mum is from here, she was born here and grew up here but we have never had peace. The people who did this are cowards who cannot show their faces and come in the middle of the night. I had kids sleeping in bed and there could be four people dead. "Instead of having a broken window we could be having four bodies going to the graveyard. "It is a shame. We were all disgusted at the Paris attacks. We are human beings like anybody else and have feelings. After Paris we were thinking what will happen next? While wife Margaret was raised in the Christian faith, her husband and two children are Muslim. In Paris on Friday night, 129 people were killed and 350 wounded when three teams of IS attackers targeted the national stadium, a rock concert and four nightspots with assault gun fire and suicide bombs. Mrs Ibrahim, who works in a jewellers in Ballymena, added: "When the Paris thing happened, in the back of my mind I was thinking some Muslim family is going to get something done to them because, as they might say, 'their lot' was responsible. "My husband's family have been living in this part of Ballykeel for 25 years. I have been living here for the last 20 years. I am originally from Mount Street in Ballymena. "My maiden name was Gregg. It is not as if I was not brought up in Ballymena and also Amin's mum was brought up in Ballymena. His father is from Sudan but his mother was brought up here. "When it happened we were all in bed and the next thing I heard the fire alarm going off and I thought it is all right as it has done that before and the next thing I heard my son and daughter saying 'get out, get out the house is on fire'. I came down the stairs to find the living room in smoke. "Thankfully no one was hurt but the living window was smashed and glass few across the living room and there was scorch damage to a chair. If anybody had been sitting there it would have been a different story. We are now going to the Housing Executive to see if we can get re-housed because we don't feel safe here any more. "This has a lot to do with Paris. I think the house was attacked because my husband is Muslim and it was Muslim people which did it in Paris and that is why they attacked our house. "I would say the people who did this to us are sick in the mind, attacking other people, not thinking of what is going to happen, having to leave your house at 1am in the morning, to have to flee where your live. I just think they are really sick minded people. 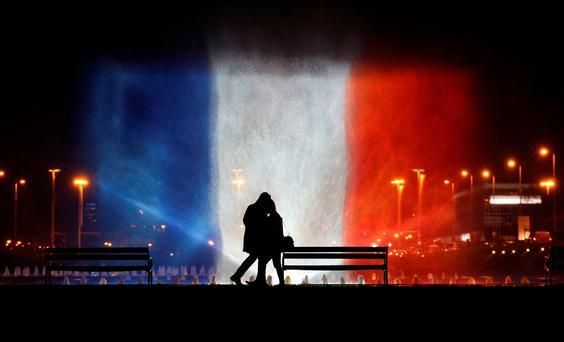 "Like everybody else the Paris attacks shocked everybody. "We had to go to my sister's who lives in the other side of the town. Neighbours have been saying it is dreadful." Police said a petrol bomb ignited in the front room, however, the flames were extinguished by the occupants of the house who escaped uninjured. Superintendent Ryan Henderson of Mid and East Antrim police said: “We are treating the attack as a religious hate crime. The home owners are long standing and valued members of our community. Police and other statutory agencies are offering support to the family. Officers have worked through the night at the crime scene and will continue to work hard to identify those behind the petrol bomb attack. “The people who carried out this petrol bomb attack are totally out of step with our modern and multi-cultural community. I am disgusted by this attack and I know that the vast majority of Ballymena people will react in a similar way. “I am thankful that we are not dealing with serious injuries or even deaths today. There were four people in the house at the time of the attack and the safety of neighbours was also put at risk early this morning. “The criminals who carried out this attack are ignorant, intolerant and dangerous people. They offer nothing to their community and the people of Ballymena. Their hateful views and intolerance have manifested themselves in a dangerous attack on an innocent family. Alderman Gregg McKeen, Chairperson of Mid and East Antrim Policing and Community Safety Partnership, added: ”Behaviour such as this will not be tolerated. Mid and East Antrim PCSP has prioritised hate crime in its current Action Plan and will continue to strive to rid our community of such despicable acts. “The Bilingual Advocacy Service funded through PCSP encourages the reporting of hate crime and supports between 100-200 individuals per month in the Ballymena area. We are hoping to extend that service to Larne and Carrickfergus in the near future. “Ballymena Inter-ethnic Forum which implements the Bilingual Advocacy Service on behalf of Mid and East Antrim PCSP is also working to promote education and awareness of different cultures among young people through Addressing Hate Crime through Art, an intervention which has been singled out for praise by the Minister for Justice”.